I was scrolling through iphoto when I came across photos taken during lunch at Cail Bruich, when, I realised that I hadn't written it up. Given that eating out is a rarity at the mo I thought it would be a shame to waste the write up so here it is. Cail Bruich means to eat well, it's a family run establishment with one restuarant on Great Western Road at the Byres Road end and the other in Quarriers village, of all places. Quarriers is in the middle of nowhere on the way from Bridge of Weir to Kilmacolm and is a registered charity. It is a beautiful place but quite isolated and not the sort of place you would expect a restaurant to be in. I don't know how they get enough custom to keep the Quarriers branch open, but they do. It was actually here that we had lunch as it is not too far from where HI's parents live. They do a lunch deal of 3 courses for £14.50 which we went fo,r but there is also a regular menu with dishes around the £6 mark. Looking at what the other diners had this might not be a bad option as the portions were larger and the food just as appetizing. I opted for the rabbbit tortellini. Now tortellini can be singular or plural and I had rather hoped it was going to be the latter, but as you can see it was the former. This was a shame as it was reasonable, the pasta a tad too thick for my liking but with the butternut squach puree and toasted pumkin seeds, it was quite pleasing. 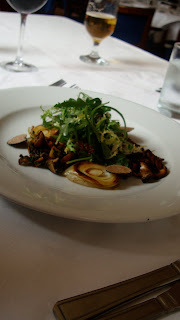 HI of course went for the wild mushroom salad primarily as it had summer truffles on it, I had a mouthful and it was good, fresh local mushrooms cooked in butter, you can't really go wrong with that. My main was very good. Halibut with chorizo and bean stew. The fish was perfect,it flaked well and was moist, and the combination of chorizo and beans rarely goes wrong. I also had ordered a side of thick cut chips which were amongst the best I have had. HI had the risotto, again becuase it had truffle in it, this time in the from of truffle oil, and I think he felt hard done by as another diner's risotto came with a poached egg on top but his didn't. It also had whole sweetcorn it it, which seems odd to me. I know you can get fancy risotto's with pureed sweetcorn, but whole? The puddings were a bit disappointing. I love lemon tart but this was way too sweet and was accompanied by a lime creme fraiche which I expected to be sour but was sweet as well. HI had an interesting pistachio sponge with rubharb and raspberries. Given that I don't like sponge it wasn't to my liking but he thought it ok. So, would I go back? I think I would, but I might try the West End branch instead. There certainly are appealing dishes on the menu with a welcome departure from the usual very Scottish take on things, for the most part the execution was good and the service attentive, so I think it's worth another shot.